This week in Boston has been absolutely frigid! It’s been a pretty mild winter and now that we’re into March, BAM two snowstorms and several days below freezing. Even though most people are desperately craving Spring, it’s clear we aren’t quite there yet. Ayurvedic food is so comforting and feels good because it brings in the very opposite of the season. When it’s cold, dry, windy, and life feels unsettled, it makes sense to eat warm, hydrating, and grounding food. Certain foods have a heating effect, which stokes agni (your digestive fire). More than warm temperature, some foods have an heating energetic effect on the body, like ginger or buckwheat. Buckwheat is a super awesome gluten free grain used in both savory side dishes and sweet breaky bowls. It tastes nutty and the texture is less sticky than oats. I buy it at Whole Foods near the granola. This time I grabbed a box of “cream of buckwheat”. Do not be turned off by the weird name, you must trust me on this. If you can’t find it, you can substitute quinoa and adjust the cooking time. 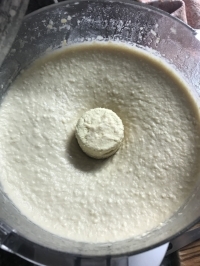 To off set the dryness of bitter cold days, make sure to add a little more liquid to your porridge with extra cooking water and a bit more hemp milk (or any kind of milk you use). Lastly, a dusting of warming and grounding spices like cinnamon and cardamom aid in digestion and complete this aromatic and cozy breaky bowl. Bring 1/2 cup buckwheat, 2.5 cups water, 1/4 cup shredded coconut, and a handful of raisins to boil. Reduce to simmer for 10-12 min, stirring occasionally. 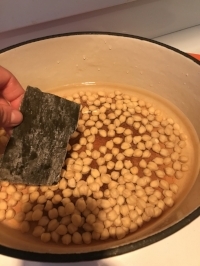 If it sticks add a little more water. Add ground cinnamon, cardamom, and pinch of pink salt. Divide porridge into 2 bowls and top each with 1/2 cup room temp hemp milk (recipe below), 1 tsp local raw honey, and 1 tsp ghee (vegans can sub @miyokoscreamery butter), and another sprinkle of cinnamon. If you have an instant pot, add step 1 ingredients and set it to 4 minutes manual high pressure and give it 10 minutes to naturally release. Blend hemp seeds and water for about 30 seconds and pour into glass jar. 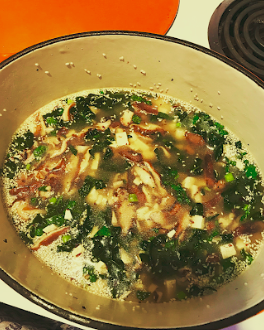 This soup was inspired by a cooking class during my training at Kripalu. I added touches of Italian, French, and Spanish influences to show that Ayurvedic cooking can apply to any region of the world, as long as you look for qualities that balance the climate and/or your constitution. Make sofrito, a slow and low flavor technique I learned from making Spanish paella: in a food processor, pulse celery, onion, garlic, fresh turmeric, and fresh ginger b/c ain’t nobody got time to chop all that. Slice tomato in half and grate using a box grater, saving the pulp. Discard or compost the tomato skin (Ayurveda says that part of the tomato is inflammatory). Heat med/large dutch oven to medium heat, add olive oil, food processor veggies, tomato pulp, spices, and salt, stir and cook for about 5 minutes. Turn heat down to low and cook as long as you can to develop a rich flavor base, until the mixture is a golden/amber hue but not burnt. For a special event I cooked this for 90 minutes. The paella recipe I learned this from recommends 30-45 minutes. Think of this process as creating the ojas, the healing nectar of the soup. Add bay leaves, thyme, root veggies, and water. Bring to a boil then reduce to simmer until veggies are tender, about 25-30 minutes. While soup is cooking, make the pasta and the pesto (recipe below). Bring a large pot of water to boil and salt generously (salty like the ocean!). Cook pasta until tender and drain. Scoop about ½ cup pasta into bottom of a bowl. Ladle about 1 ½ cups soup, then top with pesto and perhaps more olive oil. Serve with sourdough for a hearty meal. Place all ingredients in steps 1-3 into instant pot and press “sauté”. Stir until veggies soften and become translucent, about 5 minutes, be careful not to burn (my IP gets so hot I must move quickly!). Turn off sauté, add ingredients in step 4, seal lid and vent, and set Instant Pot to manual high pressure for 20 minutes. Allow for natural pressure release (which could take 20-30 minutes), or at least 10 minutes. During this down time, make the pesto topper (recipe below) and pasta. Optional step: roast pepita seeds at 300 degrees for 5 minutes and allow to cool before using. In a food processor, pulse pepitas to a coarse dust. 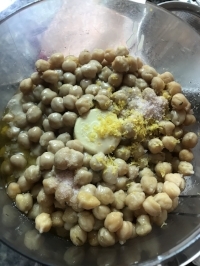 Add nutritional yeast, salt, and basil and blend. With processor running, add lemon juice and olive oil until the mixture is smooth and bright green. Top with some grated lemon zest for added vibrancy. Pepita seeds are a good source of plant protein, and nutritional yeast is fortified with B12, so this is a great vegan condiment to have on hand. This makes just about everything taste better! I used to eat Nutella by the spoon and can no longer keep it in the house. These are a healthy tribute to Nutella and are vegan/GF. Cacao is high in minerals like magnesium and antioxidants, and the subject of many studies on boosting circulation and concentration. I’ve found conflicting qualities of cacao related to Ayurveda. Cacao is both bitter and heating, and can possibly aggravate vata and pitta. But I actually think the heat is good for vata and bitter is good for both kapha and pitta. Bottom line: enjoy in moderation and observe how this superfood makes you feel in the body and the mind. Preheat oven to 375 F. In a medium mixing bowl, make flax egg by mixing 1 tbsp ground flax seeds with 3 tbsp water, let sit for a couple minutes to thicken while you gather your other ingredients. Add coconut oil, vanilla, maple syrup, spices, salt, and baking powder. Mix well with a fork. Add cacao powder, almond meal, and oat flour and mix well. Fold in hazelnuts. Scoop out a tablespoon per cookie onto a baking sheet, then gently press down with a fork to flatten a little. I use a cast iron baking tray that never sticks, if you fear sticking, grease your sheet with some coconut oil or line with parchment paper. Option: fold in a tbsp of mini dark chocolate chips for decadent melty-ness. Beautiful in color, sweet and delicious, with blood cleansing beets….this felt like the perfect way to start 2019. Balancing pitta (linked to the fire element in the body) is important for healthy complexion, metabolism, hormones, and emotions like patience and compassion. 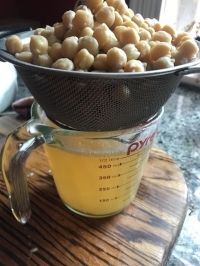 I made this more Ayurvedic compared to popular smoothies by omitting ice, dairy, nut milk or nut butter, and complicated extras like protein powder. When it comes to digestion, more is not better. Keep it simple! This contains 5 of the 6 tastes (besides salt, which I’ll get later in the form of miso soup! ), helping to nourish the entire body. Bitter and astringent are often lacking this time of year as we are all maxed on sweet and salty. Place pom seeds, celery, beet, apple, ginger, and lemon in blender and blend on low to mix. Add water, increase speed, and add the beet leaves one at a time, making sure the color is still vibrant as hell. Cheesy pasta with basil. Side of zucchini ribbons, and kale with Ayurvedic spice blend. Preheat oven to 425. Toss squash with ghee or olive oil, a little salt, and roast for 25 minutes or until tender. While squash is roasting, bring big pot of salted water to boil. Cook for 8 minutes or according to instructions. Heat small pan with 1 tsp ghee or olive oil. Add greens and sauté until bright green and wilted, about 3-4 minutes. Sprinkle with a pinch of salt and turn off burner. In blender or food processor, mix sauce ingredients until smooth, add extra water as needed, slowly. Taste and adjust seasonings if needed. Drain pasta and put back in the pot. Add squash sauce and mix. Divide into bowls, top with olive oil, good salt, herbs, and greens. While water is boiling, place all ingredients into stainless steel thermos. Take water off heat, let sit a couple minutes. Add to thermos, shake and pour. A kit I packed for my man for his trip to London. Traveling is stressful on the body and mind. The anxiety around packing and planning, weather delays, traffic to the airport, getting through security taking off your damn shoes, traveling across time zones and interfering with natural circadian rhythm. Ultra endurance coach Chris Hauth says it takes 1 day for every new hour of time zone for the body to adjust. Ain't nobody got time for that!! According to Ayurveda, the OG of holistic medicine, travel falls into the category of vata. Vata is the energy that governs all movement, whether that’s in the mind, the body, or our environment. Vata has a spectrum of balanced and imbalanced. In the mind it ranges from brilliant creative thoughts to paralyzing anxiety. In the body, vata makes us run like a well oiled machine through the cellular intelligence of peristalsis, neuromuscular movement, respiration, and normal sinus rhythm of our heartbeat. Imbalanced vata in the body can lead to digestive problems, neurological issues, respiratory distress and cardiac arrhythmias. In our environment vata moves as the wind, from a cool refreshing breeze, to a turbulent hurricane. Vata season runs from fall to winter, when it's cool and crisp. When you sit on a plane you are flying at about 600 miles/hour. That movement alone is thought to accelerate and derange normal functioning in our body which can weaken our immune system. By learning how to balance vata, you can enhance your metabolism, immune health and overall vitality. Here are some modern travel hacks, influenced by ancient wisdom, to reduce stress efficiently so you can roll up to your destination with energy. 1. Drink plenty of hot water. 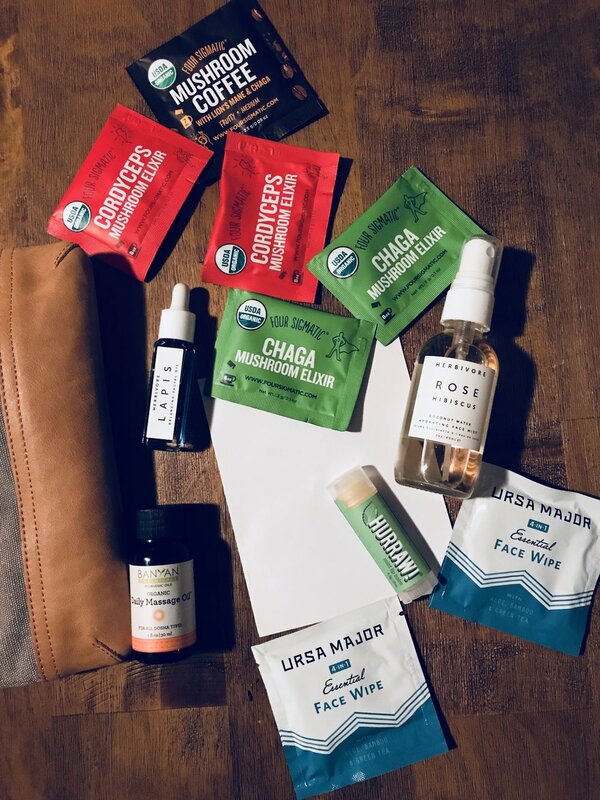 Traveling is so dehydrating and can cause constipation, headaches and dry skin. I picture sad shriveled cells. Pack a stainless steel thermos to fill up at a coffee shop once you get through security. Hot water has a cleansing effect on the body, like doing dishes with hot water. Avoid cold, iced, or bubbly drinks which can exacerbate "travel belly". Tip: pack ginger tea. Ginger boosts digestion, metabolism, dissolves congestion and strengthens the immune system. Choose oatmeal at Starbucks or a coffee shop. If you top with dried fruit and nuts, allow time for them to soak before eating. Soaking helps soften for best digestion and assimilation. BYOSS: bring your own super seeds. Pack a small jar with 2 tbsp chia seeds (omega 3s), 1 tbsp cacao powder (magnesium), dash of cinnamon and cardamom powder (calming sweet spices). 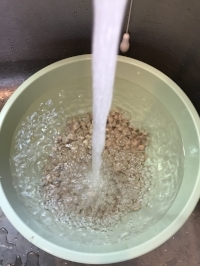 Order a steamed soy milk, which is typically already sweetened, stir in your baller bag of super seeds and let soak for 5 minutes, stirring occasionally. Pack cup of soup. Light as a feather, cheap as hell, this packs easy. I love Dr. McDougall's vegan brand, found at Whole Foods or Amazon, or this miso ramen from Trader Joe's. I mean, Trader Joe's for the win guys. Add the hot water from your thermos or ask politely for some on the plane. Cheap as hell, packs light, can't beat it. Sitting at Logan Airport, chilling because I got my breaky hack. FYI this needs a good stir and 5 minute soak. Just add hot water. Bring your stainless steel thermos and fill up at Starbucks or on the plane. 3. Nourish the ears. Vata plays a role in both sound and touch, so listen to something soothing. Create a playlist on Spotify and download to your phone before you board. My fave jazz guys are Miles Davis and Wes Montgomery, or I'll listen to any of my yoga playlists (you can friend me and listen). 4. Eat as light as possible. This will depend on the length of your flight and the advice from your healthcare provider. Preflight have a grounding cooked meal like a big bowl of oatmeal, quinoa porridge, or soup. If your flight is 1-4 hours, try to fast on the plane. Fasting between meals stimulates agni, or digestive fire. For longer flights, refer to tip #2 for easily digestible foods, and experiment with waiting 3-4 hours between meals. Drink plenty of hot water or tea in between. 5. Have a Red Eye Sleep Plan. No hack can truly replace sleep. Use a yogic approach and withdraw your senses to coax yourself to sleep. Put the tech down and rest your eyes on a real book. Not only is this better for your natural sleep hormones, it's also super romantic and intriguing these days to see someone with a real book, right? Sip a natural sedative like reishi, in these portable packets. When you're ready to sleep, cover your eyes with a mask and put in ear plugs. Drape a sign around your neck that says "Do Not Disturb." JUST KIDDING hehe. 6. Take triphala. Triphala is an Ayurvedic herb blend that means "3 fruits." It includes amalaki fruit, a powerful antioxidant that is used to reverse aging and promote longevity. It also rejuvenates the lower intestine, preventing travel belly. Consult with your doctor, but this is generally safe to take every night you are on vacation. I use Banyan Botanicals, here. 7. Save the booze for your arrival. Alcohol is mega dehydrating, sleep disturbing, and has a "reducing" or depleting effect on the body including reproductive, nervous, and immune systems. Save it for your arrival when you can celebrate your destination. 8. Oil up. Vata rules the sense of touch. We can feel irritable and ungrounded when traveling, but oil acts like a protective barrier to the nervous system. Self oil massage, called abhyanga (AB-ee-anga), is a luxurious act of self love. Before you fly, massage coconut oil into your whole body. Even better for dry skin types is this sesame herbal blend. Rinse off in the shower and gently pat dry. Armored up! You can also do your abhyanga once you arrive to your hotel. Oil your skin lovingly (or at least your feet), then rinse off in a steamy shower. The effect of this combo in unreal, as if you had a deep tissue massage and steam room, in 10 minutes. Tip: Choose natural. Our skin absorbs what we feed it into the bloodstream, so natural oils, toners and lip balms beat chemical products. Think about how skin absorbs things like a nicotine, pain, or birth control patch, so feed it what you might feed your belly. 9. Calm the mind. Take advantage of having too much time on your hands to experiment with breath work, known as pranayama. Prana means life force or vitality, so this practice can leave you feeling both relaxed and full of life. Alternate nostril breathing (hands free version): balances the nervous system and can be done anywhere, discretely. I do this as the plane takes off, an anxious time for me! Close your eyes and deepen your breath. As you inhale, visualize breath traveling up the left side of your body, across the bridge of your nose. As you exhale, watch the breath travel down the right side of your body. Inhale, watch your breath travel up the right side, across the bridge of your nose, exhale breath down the left side. Repeat for 1-20 minutes. If you've never taken a conscious breath, 1 minute is an accomplishment! Bonus if you can stick to 1 minute every day of your trip. 10. Schedule rest/oration. Sometimes our itinerary is so full it can feel exhausting. Even if you don't typically nap, a quick rest midday could refill your cup and fuel more adventure. Vata time of day is between 2am-6am and again at 2pm-6pm, the latter being a time energy levels often dip and we seek out coffee and sugar. Consider that a perfect time for a nap, legs up the wall pose, meditation, or savasana on the floor. This might reduce that run down feeling of needing a vacation after your vacation. Don't get overwhelmed attempting all of these suggestions at once. Pick 1 or 2 that speak to you and become aware of how your body responds. 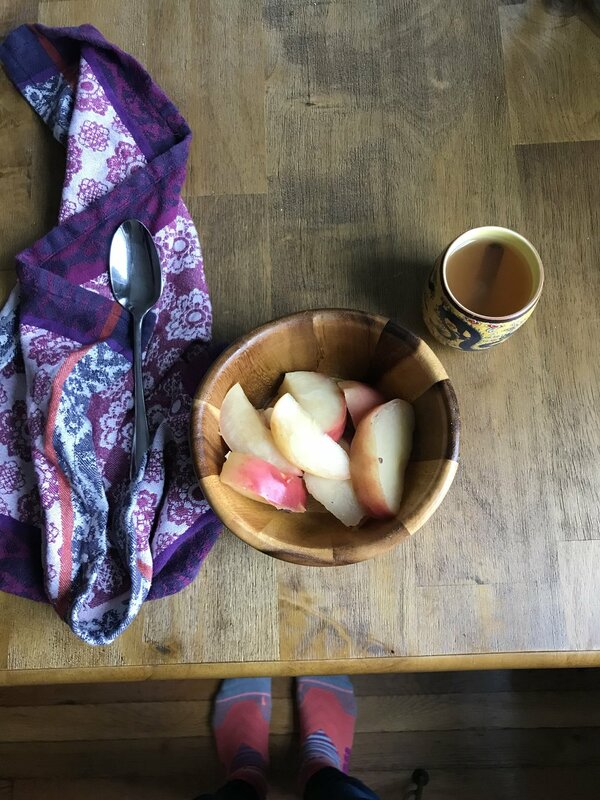 If you want more vata balancing tips, sign up here for my workshop "Fall into Ayurveda" at Coolidge Yoga Brookline, October 7th. 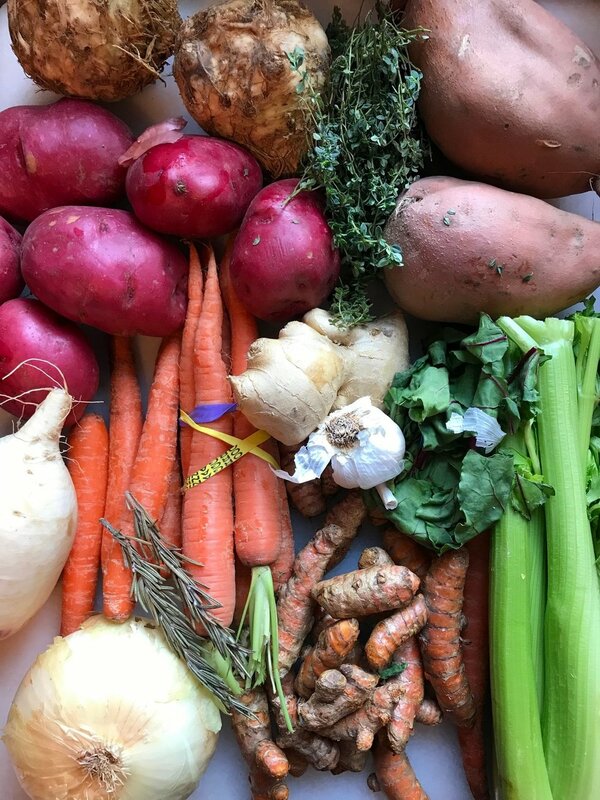 We will dive deep into what foods to favor this fall, how to start a 3-5 day seasonal cleanse (with a family style kitchari), and finish with a yoga practice to embody balanced vata. These recommendations come from my training as an Ayurvedic Health Counselor. Before implementing any diet or lifestyle chances, consult your healthcare provider. Bread gets a really bad rap now, and I can see why. It's so different than what our grandparents ate, or what you get from a Parisian boulangerie. Why is it that people who visit Paris eat a sh*t ton of bread and feel fine? For sure there are a lot of variables: the walking, the slow mindful meals (you will NEVER find a Parisian walking and eating or eating and driving! ), the freshness.....but it's the short natural ingredients list as well. The bread that sits on a store shelf for months at a time contains low quality oils and other confusing ingredients to stabilize the product. There are sometimes LOADS of ingredients in that bread (check out the flour tortillas below). If it can sit on the shelf that long, what kind of impact is it having in our body? If the microbes on the shelf aren't into it, neither are your gut microbes! Typical laundry list of ingredients in whole grain "healthy" whole grain bread including the very low quality soybean oil. Every little town, like my hometown of Mattapoisett, MA, has a bakery (Shipyard Galley) that makes their own bread. Support small business and your belly at the same time! 3. Choose sourdough or sprouted bread. All grains and beans have anti-nutrients called phytates that allow the seeds to lie dormant, so traditional slow processes like soaking, sprouting and fermenting grains break down the phytic acids, lowers gluten, lowers glycemic index, and makes them easier to digest (Douillard). Because sprouted grains break down phytic acids, they are able to retain more nutrients including include folate, iron, vitamin C, zinc, magnesium, and protein (Godman). Ezekiel sesame bread is my favorite sprouted bread. Tip: Sprouted bread is often kept in the frozen food section because it's fresh AF, does not contain preservatives and will go bad on the shelf (so put it in your freezer as well). 4. Eat bread during bread season. Yes even bread has a season, it's not something to consume all day everyday all year long. Many people with food sensitivities are told to eliminate gluten from their diet, but that might not be necessary, and completely eliminating a food group can have side effects as well. Wheat enhances the microbiome. Eliminating wheat entirely if you don't have celiac eliminates the good bugs for your body. In Ayurveda, fall and winter are the appropriate times to eat wheat. Wheat has nourishing, grounding, sticky, sweet and cooling properties. It helps build our tissues and ground our mind. Our agni (digestive fire) is strongest in the winter and can break it down much better than spring or summer. Dr. Douillard's research in his book, Eat Wheat, points out that we produce more amylase, the digestive enzyme that helps break down gluten, in the fall and winter. This matches history, when bread was harvested in fall to get people through the winter. 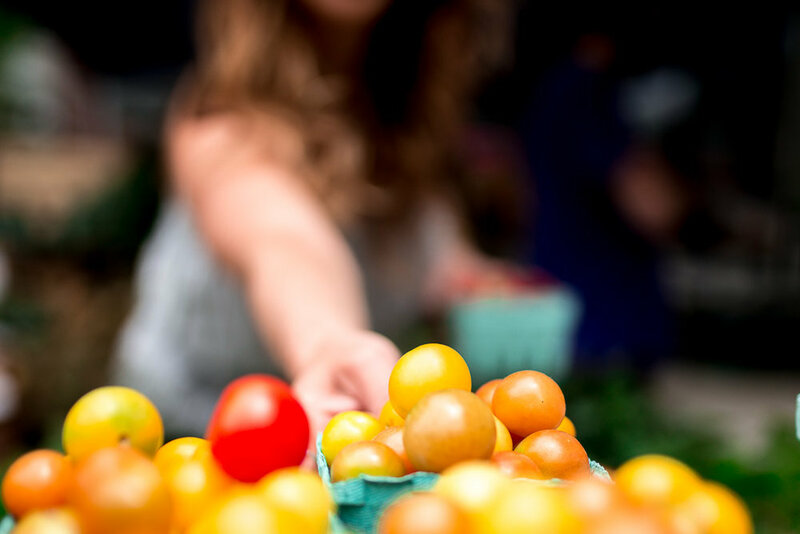 Spring is the worst season for eating gluten and can exacerbate cold and allergy season and the heaviness that comes with seasonal depression. This spring try a kitchari cleanse and see if that helps your symptoms of a low immune system, congestion and lethargy. 5. Make it a rotation. There are so many healthy grains out there to mix in the rotation. One thing I loved about living at Kripalu for 10 days at a time was the morning breakfast grain. Every morning there was something new to try: amaranth, millet, buckwheat, oats, quinoa, and barley. Try a breakfast bowl with quinoa or barley in the heat of summer, or oats as it gets chilly. Other grains include basmati, short grain, brown, wild, black and purple rice. Buckwheat and millet are heating and drying and best for the cool dampness of spring. White rice is always the easiest to digest, especially when sick. If you notice you habitually eat sandwiches for lunch, try a grain bowl with a funky grain. Instead of the flour or corn tortillas in the bread aisle, look in the refrigerated section. In my Whole Foods, this is by the fresh salsa and hummus. 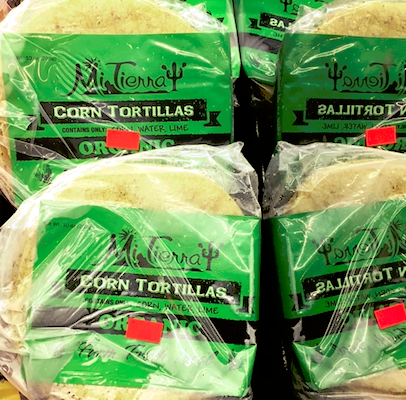 Here is where you find the handmade, real deal corn tortillas with 3 ingredients: corn, water, and salt. 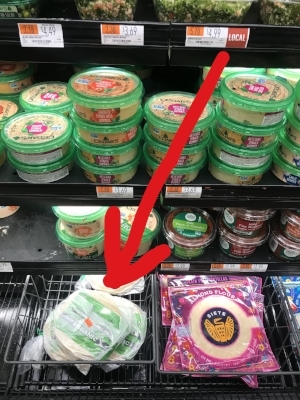 I love this brand, Mi Tierra Tortillas, shown in the pic with the huge red arrow (I hope you find my tech skills comical). Sometimes you gotta go on a scavenger hunt at the grocery. I like to shop with my man when we divide and conquer! 1. Chop basil by rolling leaves up like a cigarette and slicing into thin strips. 2. Toast bread and spread with vegan mayo. 3. 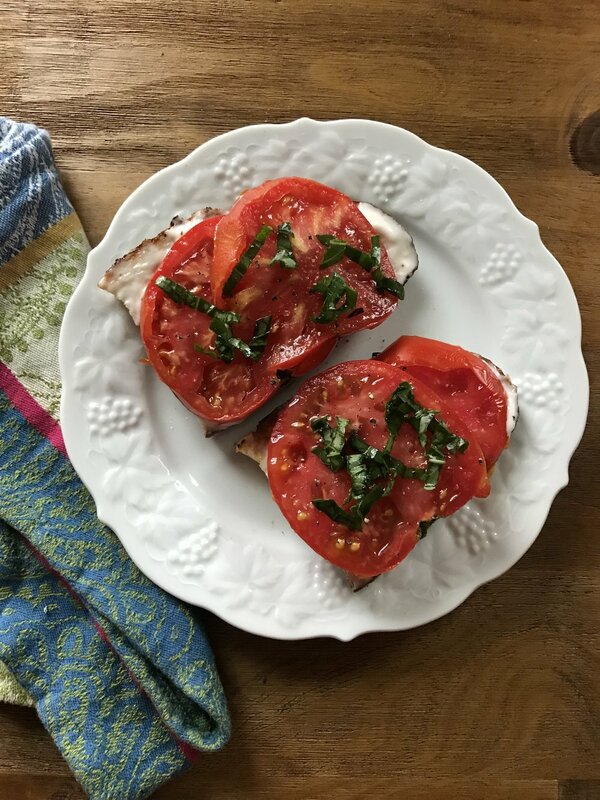 Top with tomato slices, pink salt, basil, drizzle of olive oil, and any last drips of tomato water. option 1: cut tomato in half, grate the pulp using a box grater, holding the skin. Once you grate the whole inside of the tomato, discard the skin. Mix in salt, olive oil and chopped basil. This is how to make Spanish "Pan Con Tomate". option 2: ditch the tomato and use a ripe avocado instead. Both Ayurveda and Tom Brady advise against eating tomatoes in excess because they are a "nightshade" which can cause inflammation, acidity, and excess heat. I have personally cut down eating nightshades (like peppers, potatoes, eggplant) in excess, especially out of season. You will not find me swindled by pale "fresh" tomatoes in winter. But these vegetables also have amazing health benefits including potassium, calcium, vitamins K, C, E, Bs, iron, antioxidants. Plus I have Italian roots, and in late New England summer, there is nothing, NOTHING like a fresh vine ripe tomato. So as with all things, listen to your body, eat a variety of foods, eat without multitasking, and enjoy life. Namaste! Make quinoa on the stove or in a pressure cooker**, or use leftover and warm up in a pot. Scoop 1 cup cooked quinoa in a bowl, add coconut milk to the hot quinoa so the bowl is warm. Top with jam, cardamom, pumpkin seeds and nuts. 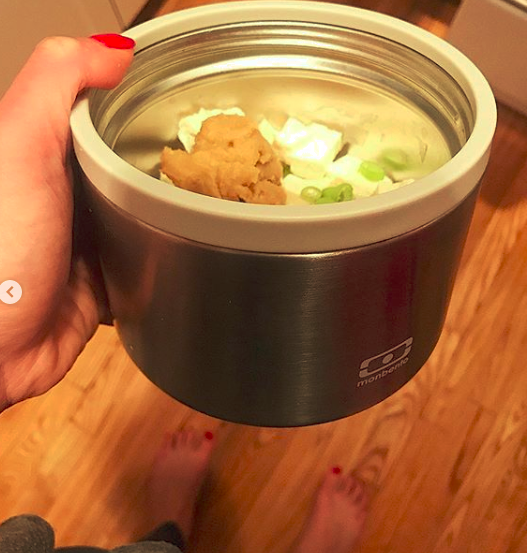 **TIP: I'm obsessed with my instant pot!! You can not F up quinoa or any other grain for that matter in an instant pot. For this method, rinse 1 cup quinoa and add to the pot with 1 1/4 cups water, seal the lid and set for manual high pressure for 5 minutes. DONE. Makes about 2-3 cups cooked quinoa.